Falmouth Today, March 6, 2014, reports “The Goose Rocks Beach case threw the beach owners up against the Town of Kennebunkport represented by the law firm of Drummond Woodsum (D/W), and to the surprise of many, the beach owners won. The fee charged by D/W was $790,135 (rounded to the nearest dollar) to lose the case. Many people wondered what the fee would be to win the case. How much more will be wasted in the appeal process or reconsideration of the Law Court’s decision? We’ve loaded just the two largest invoices out of the 49 pages you can see them below. Related: “Court to hear Goose Rocks arguments”, click here. “Lawsuit over access to Goose Rocks Beach highlighted during conference”, click here. “Beach Access Controversy | Who Owns the Beach?”, click here. Also view: No Excuses For The Law Firm of Drummond & Drummond’s Pattern Of Unethical Behavior, HERE. Drummond and Drummond Incorporators Of The Maine State Bar Association, HERE. Attorney Josiah H. Drummond and Attorney Josiah H. Drummond, Jr. are incorporators of the Maine State Bar Association. Sixtieth Legislature of the State of Maine 1881, Josiah Drummond, click here. Sixty-Fifth Legislature of the State of Maine 1891, Josiah Drummond, Jr., click here. An Act to incorporate the Maine State Bar Association, click here. 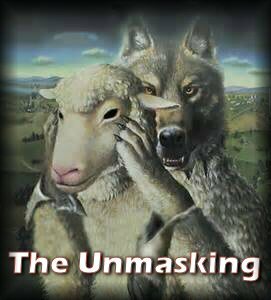 No Excuses For The Law Firm of Drummond & Drummond’s Pattern Of Unethical Behavior, click here. Atty. Robert Hirshon from the law firm of Drummond & Drummond, who represented Coastal Bank in a fraudulent foreclosure, failed “to take “reasonable” actions” in the theft of the home of Marion Lafortune. Did he not check into the documented evidence? He apparently went along with the crooks. This law firm’s pattern of unethical behavior continues to exist today. A fraudulent foreclosure was entered against Marion Lafortune on August 24, 1993 by Coastal Bank, Robert Hirshon counsel at Drummond & Drummond and former President of the ABA. Marion fought to her death and died before seeing justice. The accomplices in this theft by City of Biddeford officials, James Grattelo, Atty. Harry Center, are the same officials involved in the theft of her daughter’s home. Others involved, Auctioneer William Zafirson, Atty. Jens-Peter-Bergen and York County Superior/District Court justices Fritzsche, Arthur Brennan,Robert E. Crowley and Christine Foster to name a few. Drummond & Drummond played “behind closed doors” with City of Biddeford officials. August 26, 1994 confidential memo behind closed doors. During the fraudulent foreclosure against Marion , Coastal Bank continued to accept her monthly checks. 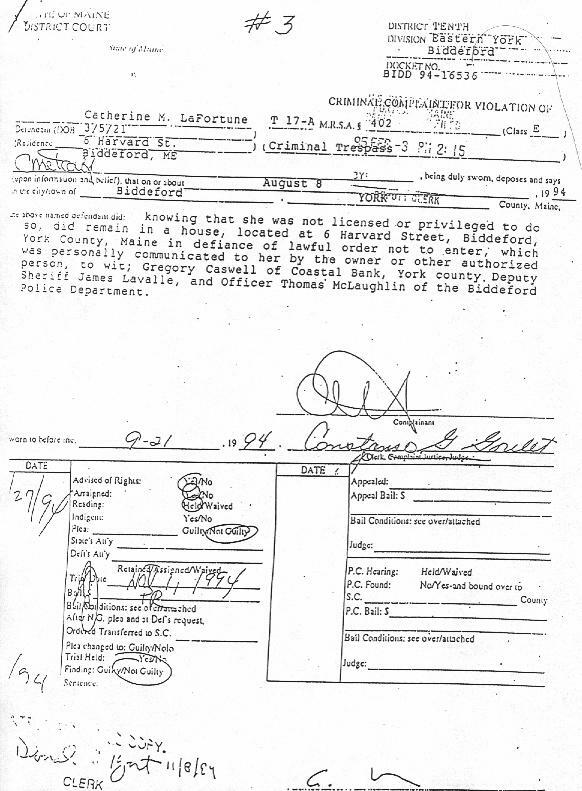 Police Report on the arrest of Marion for criminal trespass upon her own property, August 8, 1994. No judgment, no writ of possession. August 17, 1994 Marion filed an Injunction and it was denied by Judge Paul Fritzsche December 6, 1994, three months after the unlawful sale of her home. October 26, 1995 Deeds office – can’t find judgment. June 30, 1997 Maine Treasury relative to the law firm of Drummond and Woodsom. Marion was left with the clothes on her back (1994) as Southeast Moving removed all of her belongings from her home. The Bureau of Corporations shows that Southeast Moving had not filed as a business since 1992. All of her possessions were removed from her home, damaged or stolen, including the theft of her automobile which was never recovered. Local banks/credit unions pull the same stunts…rubber-stamped by the courts. Did Atty. Hirshon not view the evidence against his client, Coastal Bank? Do you think Scott Davis, Maine BAR, will hold his “buddies” accountable? And Chief Justice Leigh Saufley will agree? They are not above the law either!